Susannah Sheffer explains the startling fact that homeschooled girls are more confident, assertive and free-thinking than their traditionally schooled counterparts, and she helps put this information in perspective. Homeschooled adolescent girls are more assertive, confident, and free-thinking than traditionally schooled girls, as confirmed by research conducted by Harvard University among others. Understanding this startling fact promises to make the traditional school experience better and more productive for all girls. 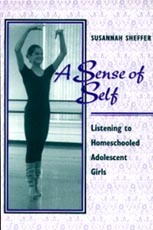 Sheffer herself interviewed fifty-five homeschooled adolescent girls --girls who learn at home and in the community. She found that these girls, unlike their peers in schools, were able to hold on to strengths they had as children and resist challenges to their sense of self. Sheffer does not offer homeschooling as a universal solution. Rather, she questions the structure and assumptions of traditional schooling and asks you to consider the perspective that homeschooled girls have to offer. Susannah Sheffer is the editor of Growing Without Schooling magazine. Her essays and poems have been published in several magazines. She lives in Cambridge, Massachusetts.